In the past two weeks, Armenia has seen massive street protests that forced long-time president Serzh Sargsyan from power. Now, the opposition is rallying in hopes of getting its leader elected as interim prime minister. We talked to Lara Aharonian from our partner organisation Women’s Resource Center of Armenia, who is an active participant in the protests. In response, Armenians took to the streets in anger. An opposition movement – made up of politicians, civil society, journalists and students – organised massive protests. Night after night, the numbers grew: from a few thousand gathering in the middle of the capital city Yerevan, to over 160 000 protesters a few days later. A first success of the protest movement was getting Sargsyan to resign. His political party, however, is still very much in power. 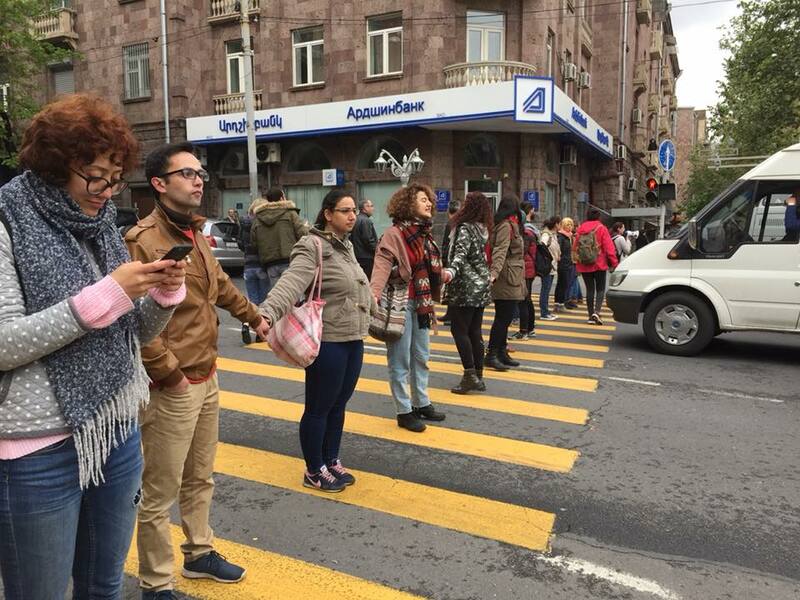 So Armenians are taking their civil disobedience to the next level. According to Lara, the current movement is unlike anything Armenians have seen before. “The ruling party never listened to recommendations by women’s groups. We tried to work with them on domestic violence, but it was very difficult,” remembers Lara. The next few days will be critical for the future of Armenia. On 1 May, parliament was set to elect a temporary prime minister. The obvious choice might have been Nikol Pashinyan, the leader of the opposition who enjoys the support of the thousands of protesters on Yerevan’s streets. However, the ruling party refused to back Pashinyan’s bid. This resulted in another wave of protests and civil disobedience that practically brought the country to a standstill. Next week, parliament will convene again on 8 May. The latest word from the ruling party is a promise that they “will back any candidate who gets over one third of the vote.” So far, the party has not nominated a candidate themselves, making Pashinyan the sole nominee. If members of parliament fail to agree a second time, parliament itself will be dissolved and general elections will be called. Kvinna till Kvinna is not politically, religiously, ethnically or linguistically affiliated to any group or movement.